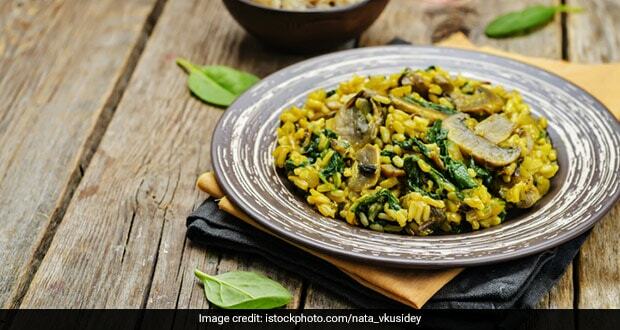 About Spinach and Laal Math Broken Wheat Pilaf Recipe: A delightful vegetarian pilaf made with broken wheat, spinach, laal math and a host of other veggies. Give your day a healthy start with this recipe. 1.In a blender, add the carrots, onions, leeks, garlic, celery, ginger and green chilli. 2.Blend it into a chunky paste. 3.Boil the vegetable stock with a pinch of saffron. 4.In another pan add 1 1/2 teaspoon of olive oil and sweat half of the previously made chunky paste. 5.Add the broccoli stems. Blanch the spinach and laal math in hot salted water for just a few seconds and immediately add to the pan and saute with the other vegetables. 6.Saute well and add lemon juice, salt and pepper and a pinch of lemon zest. 7.Add 1 1/2 tablespoon of the stock into the vegetables. 8.Add the drained broken wheat and mix very gently. 9.Add the broccoli florets and grated parmesan cheese. 10.You may need to add a little more stock if you want a porridge consistency. 11.Serve the porridge warm or cold with parmesan shavings.